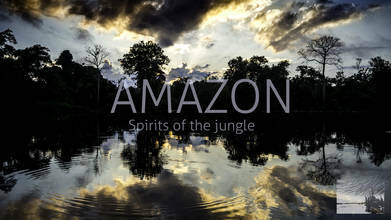 Description: "Amazon, Spirits of the jungle", a short film that explores the deep of the Amazon jungle. Located in the heart of Pacaya-Samiria National Forest Reserve, offers a great biodiversity in almost an entire territory of a floodable jungle. Among different species such as manatees, jaguars, tapirs, spider monkeys, anacondas or poisonous snakes, pink river dolphins are one of the most iconic animals of this reserve. Besides that, opaque black water colors rivers and reflects the sky, with its clouds, and huge trees as an enormous natural mirror. This project has the additional purpose of creating awareness and protects the subsistence of this wonder of the world. Music by The Pangolins, "Kijal" and "The Mode of our Consequences". Equipment used: Olympus OM-D E-M10 Mark II - Link Amazon - https://goo.gl/TE5Ag6 Rollei Compact Traveler No. 1 - Link Amazon - https://goo.gl/8fzQg3 Syrp Genie Mini Pan Tilt Kit - Link Amazon - https://goo.gl/fC3h95 Syrp Filter Super Dark variable ND - Link Amazon - https://goo.gl/yayZeG DJI Mavic Pro - Link Amazon - https://goo.gl/kXv224 For more gear just check out my page https://alejandrotellomart.wixsite.com/zenithfilmsstudio Processing and editing were completed in Lightroom CC 2015, After Effects CC 2017, LRTimelapse 4, DaVinci Resolve 14. Please do not use this video under any circumstance without permission. All footage is available for licensing. If you are interested in acquiring any of my clips please contact me.